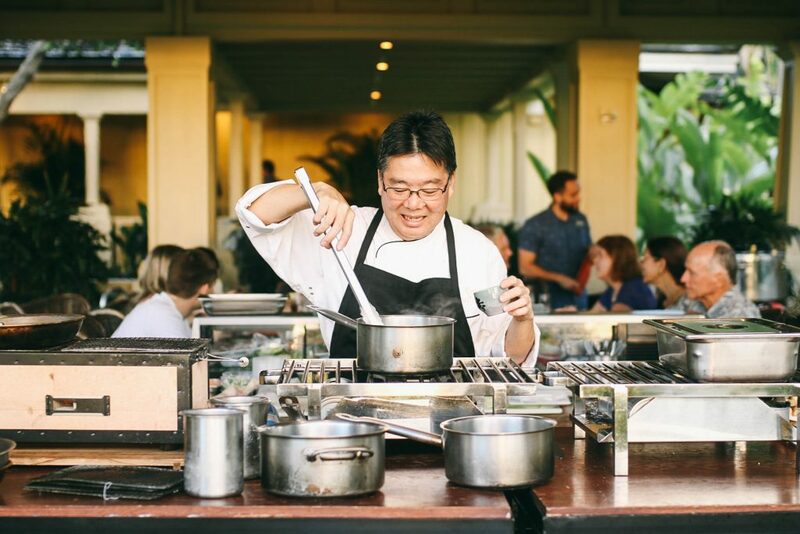 Nearly every Saturday, the O‘ahu native can be found happily working his gastronomic magic in a gleaming pop-up kitchen—complete with special sushi chiller— on the Private Dining Hale: a covered verandah just off the Club’s main dining room, with an idyllic backdrop of lawns, trees, sea, and sky in radiant hues of green and blue. 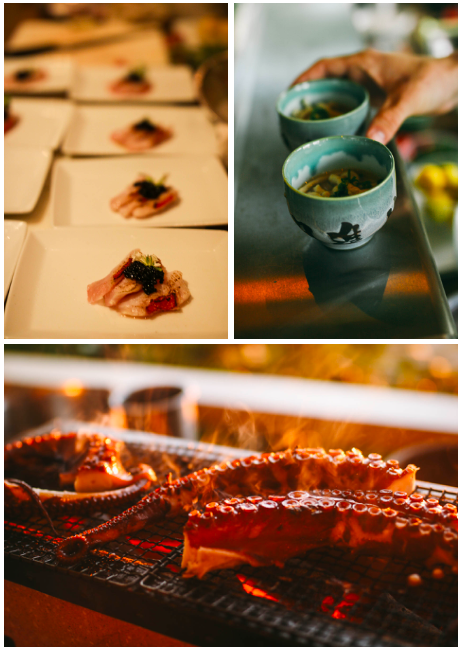 There, surrounded by the beauties of Nature, Chef Ben focuses his extraordinary skills and talents on preparing exquisite omakase meals to be served that evening. On these occasions, the fortunate feasters (never more than eight) sit together at a long table, and this arrangement, along with the congenial and entertaining presence of the chef from start to finish, results in an unusually intimate—and delightful—dining experience. 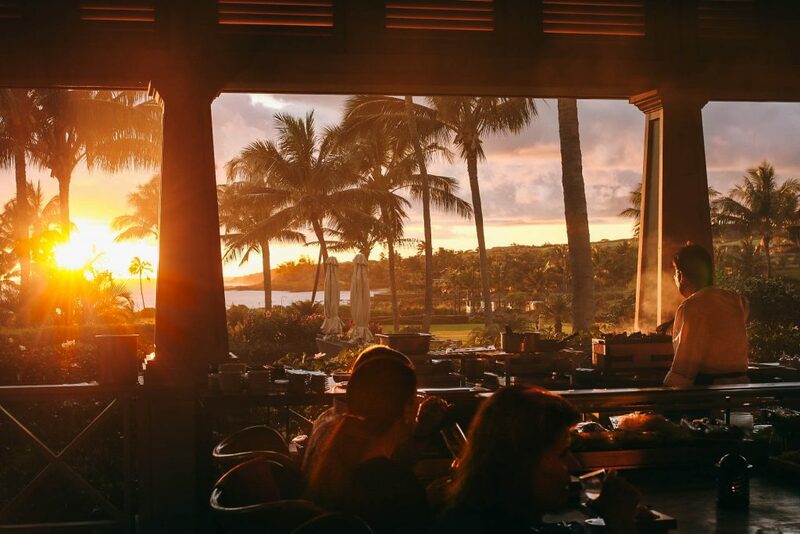 At Kukui‘ula, a typical omakase menu will include approximately fourteen courses. There’s always rice (white or brown) and a soup course, which may be hot or cold. Tasty sources of protein play a starring role, and specialties flown in from top suppliers in Japan include numerous types of fresh fish (tuna, saba, hamachi, hirame, ayu, butterfish), abalone, uni (sea urchin), aori ika (bigfin reef squid), and A-5 Miyazaki beef—the highest possible rating for Japan’s famously tender wagyu beef. Vegan or vegetarian meals are available on request, with hearty veggie or mushroom dishes in lieu of meat, fish, or seafood. At least half of the fresh, flavorsome produce originates at Kukui‘ula’s own Farm or nearby (hence, “locavore,” meaning “grown within a 100-mile radius”). In addition to the usual lettuce, greens, herbs, and root vegetables, the cutting-edge Farm also harvests such typically Japanese crops as daikon, shiso (perilla), and mizuna, along with vivid orange nasturtium blossoms used to top a crisp green salad or garnish the perfect paleness of a fish dish. In a typical omakase meal might include such dishes as pickled fennel, salted cabbage, fried eggplant, grilled romaine, pickled daikon, fire-roasted baby carrots, wilted katuk (a tropical leafy green), watercress with sesame oil, or a mushroom melange of shiitake or ‘alii oyster mushrooms from Hamakua, on the Big Island. 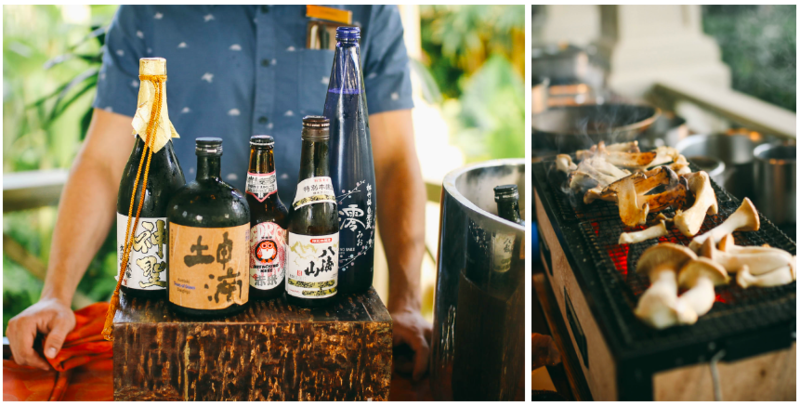 Several carefully chosen sake pairings accompany the meal, and Dominic Johnson, one of Kukui‘ula’s exceptional sommeliers, is on hand to illuminate the provenance, characteristics, and harmonious aspects of each pour as the dinner progresses. In keeping with the improvisational nature of these occasions, diners are treated to Chef Ben’s “talk story” comments about each dish in lieu of the customary written menu. “There is no written menu, and that’s part of the fun of doing omakase,” he says. “I have a list of items that I’d like to showcase, and I make different types of garnishes and assemble the plates as we go through each flight.” Speaking off the cuff, Chef Ben will describe his culinary influences, share lively anecdotes about growing up in a family of gifted cooks, and annotate the impeccably fresh, high-quality ingredients. Finally, for the perfect ending to an ideal meal, there is always a light, airy dessert course. This might feature a traditional Japanese sweet such as dumplings (dango) dredged in nutty, golden-hued kinako (soy flour), served alongside house-made ice cream or sorbet flavored with fresh-squeezed citrus (kalamansi, lemon, lime), honey, chai, vanilla, chocolate, or pumpkin—to name a few of the delicious possibilities shaped by the current bounty from The Farm and its surrounding orchards. “I am very fortunate to be the executive chef at The Club at Kukui‘ula,” Chef Ben muses, as he takes a quick break from creating memorable masterpieces to gaze out across the Great Lawn toward the luminous blue-green sea.